African Christians visit Shiloh testifying to ancient Jewish presence, vow to warn their nations about media lies on the conflict. 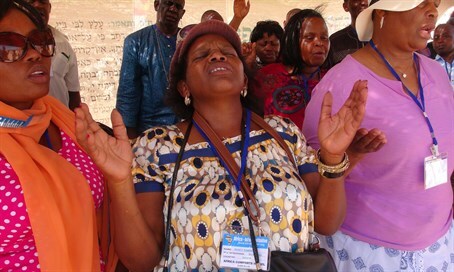 Arutz Sheva got the chance to speak with a group of 53 Christian African tourists on Tuesday, who came to visit Israel for a one-week tour guided by The Africa-Israel Initiative and while in the Holy Land made a stop in Samaria. Ntayomba Emmanuel of Rwanda said that this is his eighth visit to Israel, and when in the Holy Land "I learn the Bible better, and I understand the Bible." Arutz Sheva caught up with the group in Shiloh located in northern Samaria, which as Emmanuel pointed out was the site of the first Tabernacle, the precursor to the Holy Temple in Jerusalem. The visitors hailed from various countries, including Rwanda, Uganda, Kenya, Ghana, South Africa, Nigeria, Congo and Madagascar, and they were led by guides from Norway. "When you come to Israel you see different stories from what you see on CNN, in newspapers, you see different things, because Jews here they stay peaceful with Palestinians," said Emmanuel, who revealed that during the trip he saw Palestinian Arabs harass Jews. "But when we hear the news they tell us that Jews always fight Palestinians which is not true. And when we go back we have to tell our nations that it's a lie." The tour was guided by Pastor Jostein and Margun Skevik, who spoke about their organization, The Africa-Israel Initiative. The pastor said the group works on two levels, first with parliaments in Africa to build support for Israel, and secondly with African churches to educate and bring them on tours of Israel. Jostein Skevik said, "we don't believe in a two-state solution. We believe that G-d gave this country to the Jewish people. We believe in one state." "We also believe that there's room here for Arabs and Jews to live here together in peace. But for that to happen the Arabs have to recognize the state of Israel. ...We want the international community to see that Israel is not occupying." Speaking about the importance of ancient Shiloh, he noted that "these stones are talking, this is proof of Jewish presence in this country for thousands of years."